I don’t usually win things, so I was extra-specially excited to win this fabulous book from the brilliant Me and My Big Mouth. I have been following Jen’s progress on Twitter and her blog for a while now and have been desperate to get a hold of Weird Things Customers Say in Bookshops. The title pretty much says it all. If you have ever worked in a bookshop – or any shop for that matter – you will understand that customers say a lot of strange things and this is a collection of some of the most bizarre and most entertaining! Whoever you are and wherever you work, this book will leave you in stitches! Years of working in bookshops and putting up with odd requests and strange queries has made Jen more than qualified to put together such a hilarious collection and she sure had loads of material to work with! The book is separated into three sections; Tales From the Edinburgh Bookshop, Tales From Ripping Yarns (the bookshop Jen currently works at in London) and Weird Things Customers Say in Other Bookshops. The last shows that weird things are said in bookshops all over the world – well it’s good to know it’s not just Britain! I devoured the whole of Weird Things in one go on the day I got it, reading the funniest bits aloud to my mum. A few weeks later, I was having a bad hair day and picked the book up again for some instant giggles! The wonderful illustrations and laugh-out-loud content are enough to put a smile on the grumpiest face. I still haven’t got around to visiting Ripping Yarns in London, which looks like my sort of bookshop, but when I do finally get there, I will have to be extra careful to not say anything stupid – I wouldn’t want to be in Book 2! This book is a superb gift idea for book sellers and book lovers! To buy a copy, click the picture below! 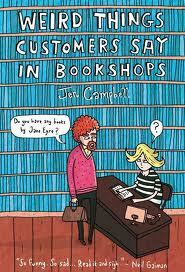 It’s particularly funny for anyone who has worked in a book shop – or any kind for shop for that matter. I just hope that I don’t ask too many silly questions when I’m shopping! Sounds absolutely hilarious. I’ll have to suss it out! It really is funny! You should definitely read it! It’s great – full off laugh out loud moments!